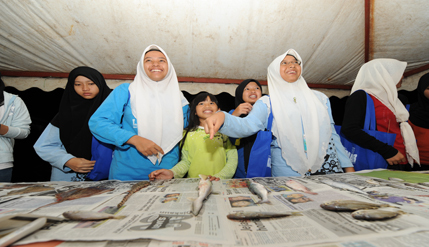 BANGI, 24 Nov. 2010 – For the second year running, the Marine Ecosystem Research Centre (Ekomar) of Universiti Kebangsaan Malaysia has targeted secondary school students in its outreach programme to create awareness, concern and protection of the marine world. 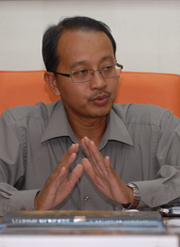 The second outreach project was held last month (Oct.) for 33 students from two schools in Mersing, Johore where Ekomar is building a research centre and from where its officers, scientists and researchers are conducting their field work, said Prof Dr Che Abdul Rahim Mohamed, head of Ekomar. Secondary school students were chosen so that they can pass on the information to their families and friends, thereby setting a train of multiplier effects to the local populace on the important of protecting the marine ecosystem of one of the richest fishing ground of the country there. “How long and how well the marine resources or wealth can last, will depend on how well we can protect the marine environment and all the marine life, especially the corals and mangrove forest which are the breeding grounds for fish, prawns and other marine animals,” he said. For this reason, the local communities must be made aware of the importance of protecting and preserving the marine ecosystem if they are to have a bountiful harvest of seafood. 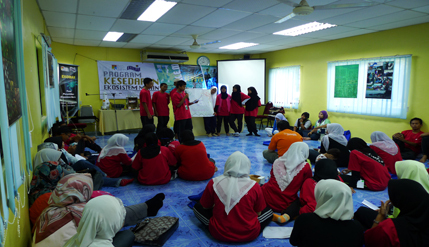 For the second outreach project, Ekomar brought 20 students from Sekolah Menengah Sains Sultan Iskandar Mersing and 13 from Sekolah Kebangsaan Sri Mersing, together with their teachers, for a three-day programme from Oct. 22nd with the cooperation of the Mersing District Office and the Mersing District Education Office. Divided into four groups, the students were guided by the lecturers and scientists from UKM to understand and appreciate the diverse marine life, the need for a healthy and thriving mangrove forest, the love for the beautiful beaches apart from how to have a healthy body and healthy mind. The group were also took part in cleaning-up the Mersing beach as well as appreciation of poems on men and the environment. “The module on the Diversity of Marine life, for example, was conducted by Dr Abdullah Samat and Encik Wan Lotfi Wan Muda of the Faculty of Science and Technology and they involved lectures and field work to collect and identify marine organisms found on the beach and the fishing boats on their return from the sea. “Our aim is also to kindle their interest in marine life and the ecosystem so that some of them may pursue a career in this field,” Prof Che Rahim said.